Images Archives - S.U.R.E-Pak® ~ Safe. Universal. Reusable. Economical. 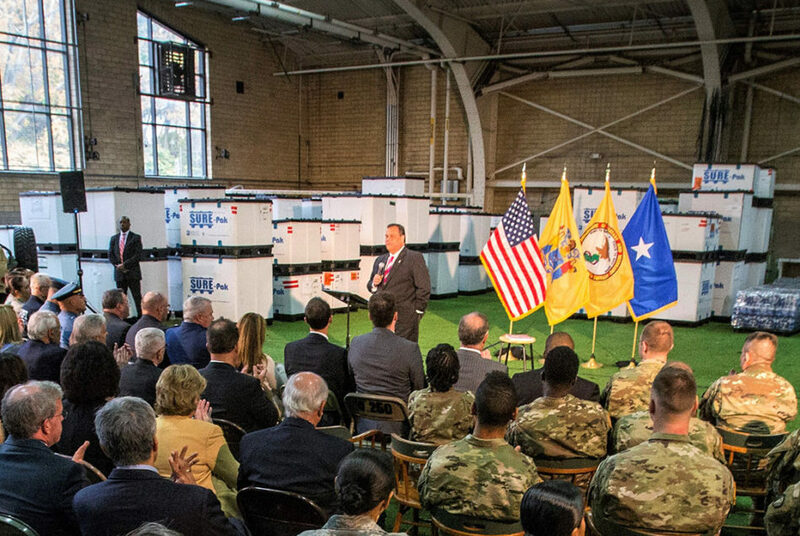 SURE-Pak bulk containers provide a backdrop as New Jersey Governor Chris Christie addresses the audience during the Stronger after the Storm event acknowledging first responders shortly before the fifth anniversary of Superstorm Sandy at the National Guard Armory in West Orange, N.J., Oct. 24, 2017. Each SURE-Pak bulk container is collapsible, reusable, can hold 2,000 lbs and stack four units high. The National Guard has been utilizing the SURE-Pak pallet packs to transport and distribute crucial relief supplies to Puerto Rico and the US Virgin Islands in the wake of the 2017 Hurricane Season. The U.S Air Force loads a SURE-Pak Bulk Container filled with cargo into a C-130 Hercules at Forward Operating Base Sharana, Paktika province, Afghanistan, Sept. 28, 2013. This mission marked a retrograde milestone as the 774th EAS transported the last cargo from FOB Sharana before the base is transferred to the Afghan Ministry of Defense.